So I’m still working on getting my team together for the celestial tournament. (part I is here for those who missed it). 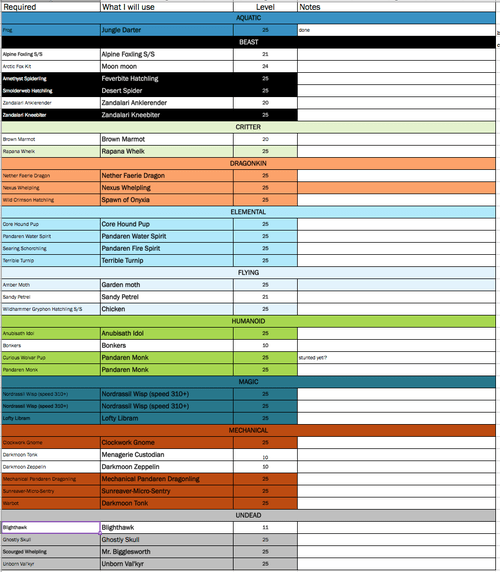 I’ve been using a spreadsheet to help me keep track of the pets I need to capture/level. I didn’t have all of the recommended pets, but I do have a lot of alternatives, so that’s helped. I’m now at the point where it’s the hard grind to get everyone to 25. Doing the Pandaren spirit/tamer dailies definitely helps get levels done quickly. But after that it’s just a grind. Getting there, though!